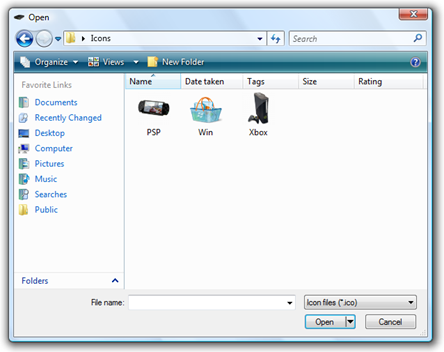 Drive Icon Changer helps you customize your hard drive icon shown in My Computer and Windows Explorer to an icon of your personal choice. Like Turn Off LCD, I developed this little tool in C# using Visual Studio 2008 to change drive icons on the fly. It just takes a couple of clicks to customize the icon to your personal choice. To change the icon, simply select the drive from the drop-down menu of which you want to change the icon. Then browse to the location of the icon you desire and click “Save”. NOTE: If you want to change the icon of the drive on which Windows Vista is installed then you will need to run the program as Administrator. Right-click -> “Run as administrator”. Voila! you are done. You will need to restart your computer for the changes to take effect. You can always go back to the original default icon of your drive by clicking on “Restore Default”. Now lets take a look at what this app does under the hood: It creates a file named “Autorun.inf” and makes a copy of your selected icon in the root of the drive. Both of these files are set to hidden. You can see these files by enabling “Show hidden files and folders” in “Folder Options”. Of course you can change the icons manually too by creating an *.inf yourself and then adding those lines etc. but with this application, you can change the icon and then can restore back to the original all with just a couple of clicks. Here is how it looks after you have customized your drives with the icons of your choice. Looks cool isn’t it? Last but not the least, you are free to distribute and use this application. As usual I have tested this application on Windows Vista only. Please let us know if it works on earlier versions of Windows. 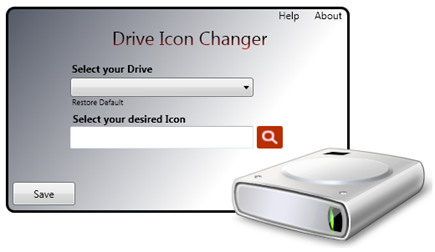 Download Drive Icon Changer and customize your drives with your own icons. UPDATE: Due to popular demand we received about the icons, we decided to bundled them all and have released them in a package. You can Download Drive Icon Pack for Drive Icon Changer here. Would be nice if the app allowed for any drive letter and didn’t limit to specified driver letters. Very cool app that makes this task a lot simpler, nice icon pack as well. does it work for cd/dvd drives too? vartaxe: No it doesnt work with CD or DVD drives because you cant write the required files on CD/DVD drives. Is there another pack of icons? I have a hard drive dedicated to storage music…thanksss!!!!!!!!!!!!!! How to restore Icons to default ? How do you uninstall? Doesn’t appear on the list of programs. Sorry, but I never got the program to work. I appreciate you telling us how it works because I accomplished my goal by editing the autorun.inf file directly. However, now I would like to uninstall. Thanks in advance for assistance. This is excelent, but I have drives M, P, X and Z Is there a way to get these done without changing the letter? It does not see the USB/Firewire external drives. Is there a version that can see external HDs? Hi there. This program looks great, but I would like to know if it will work with Win 7 before I download it. Thanks. Yes, it will work on 7. It's for internal hard drives only. How come my Removable drive doesn't show up in this tool?? Talk about going into a site. 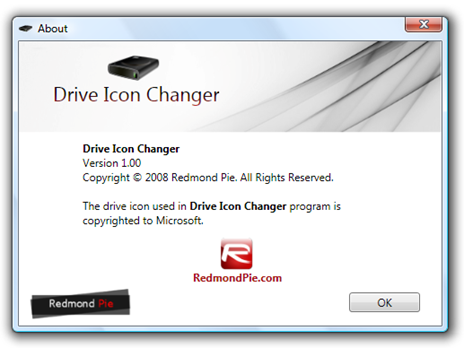 I am running Drive Icon Changer on Windows 10 PRO 64BIT and only have 1 issue that I need help on. However Drive Icon Changer only has to letter H or so it seems to me. Is that the limit to change Drive Icons?